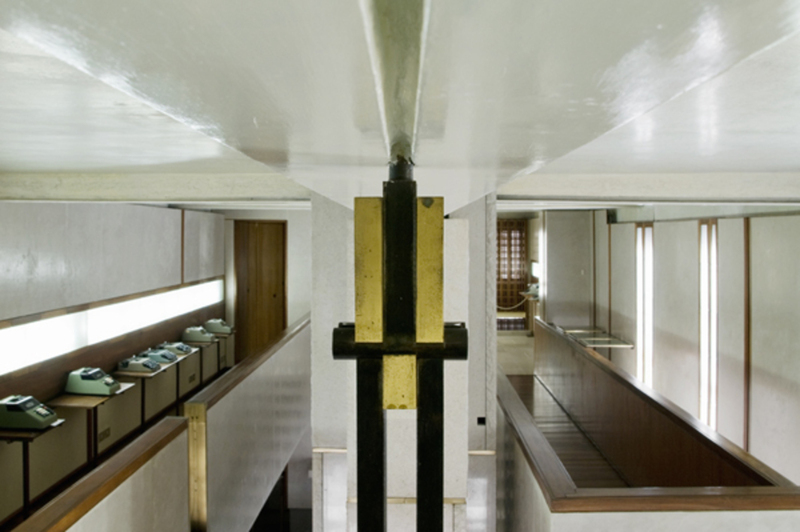 Carlo Scarpa, Olivetti Showroom, 1957 - 1958, Venice. WHEN CARLO SCARPA ASSUMED LEADERSHIP of Istituto Universitario di Architettura di Venezia in 1972, he directed that graduation diplomas be inscribed with the aphorism of the Counter-Enlightenment philosopher Giambattista Vico, Verum ipsum factum—truth itself is made. Scarpa shared Vico’s understanding of the world as constructed rather than observed, a product of creative individuals rather than universal reason. A voracious reader and an ambidextrous draftsman, Scarpa nevertheless insisted upon the built. In particular, he made strange with it. This is partially attributable to Scarpa’s having lived most of his life in Venice. Venice discounts the first assumption of architecture: the ground. Built on mudflats, the city is subject to winter floods that underscore the ground’s provisional status. Equally unsettling, Venice’s maze of streets, reflections of water, and atmospheric effects conspire against the unifying gaze of perspective. Scarpa’s insistence upon the built was a quest for understanding a world that was strange to convention. Scarpa’s tenure at the Murano glassworks was a peculiarly Venetian architectural apprenticeship. Rather than interning at an office to hone his professional skills, Scarpa immersed himself in an ancient craft to explore qualities that ran counter to the modernist principles that dominated conventional practice of the time. Working directly with master craftsmen in the foundries of M. V. M. Cappellin and later with those of Paulo Venini, Scarpa became fluent in glass’s paradoxical effects. While modernism extolled glass’s thinness, hardness, and transparency, Scarpa developed an intuitive understanding of glass as a supercooled liquid, its visual thickness of color, pattern, and light challenging perceptions of scale and form. 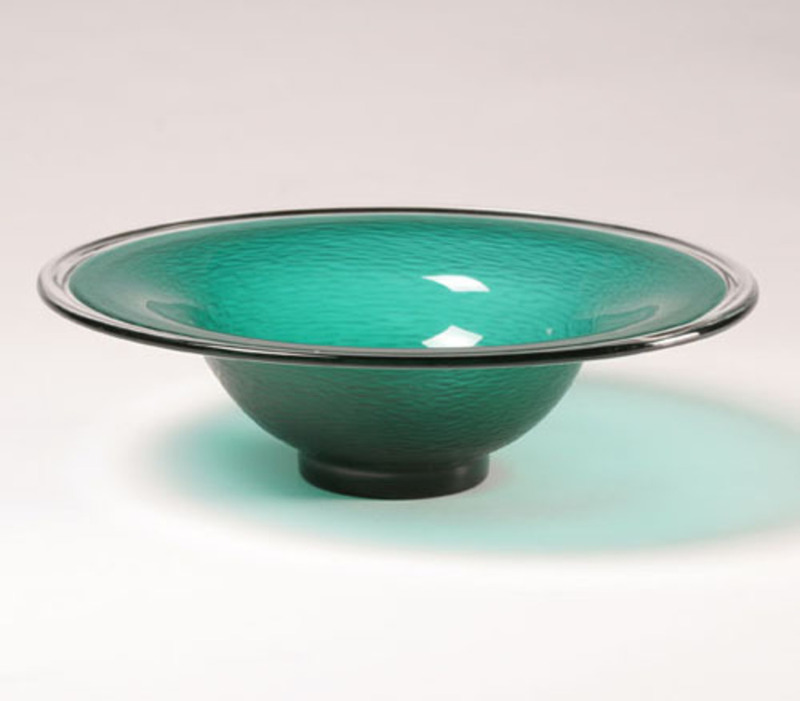 Carlo Scarpa, Battuto bi-color glass bowl, 1930's, 13 1/2" diameter. Such is the case with one of Scarpa’s first works at Venini, which deployed the bollicine technique to suspend miniature bubbles within turquoise depths, resulting in vases that look as if they might not only hold water but be made of water. Shortly thereafter, Scarpa exploited ambiguities of scale through the sixteenth-century mezza filigrana technique of bonding thin colored rods and then blowing them into delicate shapes that possessed an uncanny monumentality. Moving still further back in time, Scarpa turned to the Roman murrine to generate hovering fields of color, an effect that he later accentuated with the puntini, which set color free from murrine’s defining field, and the facse applicate and macchie series, whose drifting colored figures overwhelmed the vessels’ forms. Even when glass was rendered to give sensation a tactile purchase—corrosi’s rough finish, battuto’s hammered surface, or incisi’s precise patterning—color, scale, and translucence undercut the assurances of a hand’s grasp. And when form seems to predominate, such as with the lattimo and incamiciati series, color either retreats, leaving form’s ghost, or oversaturates, swallowing form. Towards the end of his time at Venini, Scarpa addressed glass’s form-making capacity in the conchiglie series: soft memories of marine shells adrift in wavy patterns, aquatic hues, and iridescence. View of “Carlo Scarpa: Venini 1932–1947,” 2012, Le Stanze del Vetro, Venice, Italy. Scarpa left the glassworks in 1947 to concentrate on architecture, but the institution’s lessons stayed with him. His erudition and empathy for artwork played out in museum renovations and additions—the Palazzo Abatellis, the Gallerie dell’Accademia, the Gipsoteca Canoviana, the Querini Stampalia, and the Castelvecchio, among others—as well as numerous installations of contemporary art, particularly at successive Venice Biennales. Scarpa’s interrogation of craft continued with these commissions and elsewhere, such as with the Olivetti and Gavina shops, the Banca Popolare di Verona, and what he considered his masterwork, the Brion Cemetery. Throughout this work, Scarpa draws us into a world where the ground drifts, solids double and liquefy, and material effects trump stable perceptions. In his final residential commission, the Villa Ottolenghi, the ground itself seems to liquefy as if it might be blown like glass, its bollicine of living spaces nestled into a Bardolino hillside. Scarpa’s sensibility, which finds its first realization in the glassworks of Murano, was more aquatic than terrestrial, and the world that he opened to us breathes with strange continuities. Michael Cadwell is the Walter H. Kidd Professor of Architecture, the director of the Austin E. Knowlton School of Architecture at Ohio State University, and author of the book Strange Details from MIT Press.